Hey there C&V folks, I work at a bike co-op (or community bike shop) and we pulled this very rough old thing out of the local recycling depot earlier this year. It was clearly something pretty nice in its day but I have no clue what it is. One of our patrons is thinking about stripping / powder coating it but we're trying to get an actual ID on the frame first. It has Campagnolo drop outs , BB , headset and a vintage TTT stem. Not much else original. Anyone have any ideas? Sorry about the less than ideal pictures. The headbadge is pretty much rust at this point but I gently rubbed some of the worst of it off. I don't recognize it but I'm hardly an expert. I can answer any questions / get more photos if folks think it would help. Wowza, that was fast / dead on. I'm very impressed rhm. I've never heard of / run across any Lygie bikes going to have to do some digging. Thanks! Pretty neat. Also rather rusty, and that rust looks rather bad, especially around the seat tube lug. Is that a rust hole? Just went and double checked! Thankfully not a hole, just some gross mud. Still you're not wrong, it's VERY rough. A bicycle with a story to tell. 1978 expiration City of Los Angeles bike license on the seat tube. Glad it's not a hole. Worried that some of that rust will open holes when cleaned/treated. It's a neat bike, hope you can do something with it. It would have been imported by I. Martin Imports on Wilshire Boulevard in Los Angeles. Lugset is Agrati "ROMA" pattern. Is the top tube bowed/bent? I really wonder how it made it from Los Angeles all the way up to Winnipeg. Very interesting. I saw that page / it's one of the only ones I've seen dedicated to the brand. Very helpful. Going to try and determine what it's made of as it seemingly varies a good amount. Also, don't think the top tube is bent. Just a symptom of the iffy photo and the cable housing. Going to try and determine what it's made of as it seemingly varies a good amount. Pillar size is the easiest clue here. 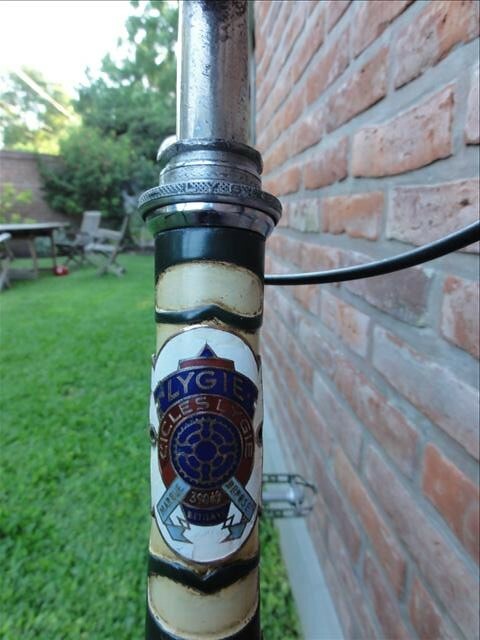 there were a lot of Lygies sold in LA back in the bike-boom era. Guess that it's because the importer was right there on Wilshire Blvd. Yes, and also the fact that other folk had the rights to Cesare Rizzato's other main brand, the Atala. He also produced a rock bottom economy badge called Atlantica which was stocked by I. Martin Imports as well. Some southern California Lygie retailers carried them. Bikes: My 1978 Raleigh from new, 1995 Trek, & constant changing & rebuilding of other bike projects. Agree with above, I copy pasted it did a bit of photo edit along the bottom of the top tube, shows it has a dip, maybe of course just photo, but try holding a straight edge along the bottom side, if it is ? then along with all the heavy rust around the seat tube, one wonders if its worth it, as those seat tubes will not rub away without leaving bad rust score marks. Good find though. I really wonder how it made it from Los Angeles all the way up to Winnipeg. Very interesting. Perhaps a Winnipeg Icelander came to Los Angeles for their university days, puchased cycle and returned home with it after graduation. underside of shell will likely be marked with number 21 in two places. this is the nominal size of frame in inches. if you sand down right side of seat tube about five cm below seat lug you should find serial number. it will probably have an alphanumeric format beginning with two numerals, then the letter A followed by four numbers. the first two numbers are the year of manufacture. Some bad news on this crusty old frame , after I started derusting / basic cleaning I noticed the downtube had a small but decent ripple in it. Someone had a decent head on collision. Given how rough it is I don't think it would be worth an attempt at repair. Sad news for a neat old bike but if folks are interested I can start a thread about some of the other interesting things hanging here in the basement. Did your explorations uncover a serial number? If it's just the photo, that's some weird pincushion. when i first saw the campag bb fittings thought "...must be that campag chainset added post manufacture as a cycle which came with a record chainset would not have come with a way-assuato headset.." then noticed that spindle is black oxide finish and a wee lamp illumined in what passeth for me "braine." bicycle from just the right era for the campag sport chainset ref. 3320. its bottom bracket spindle has the black oxide finish. Good call, and as was usually and still is the case, the cheaper models sell in bigger numbers that the top-tier full-Record bikes. I have sure come across a lot of such mid-level Bianchis over the years, with just a few select Campag components and with the rest being Ofmega and so on.